Plato has been characterised in almost as many ways as he has had interpreters. The plagiarist. The mystic. The con-man. The proto-fascist. The dualist. The monist. The arch-rationalist. The great spiritual thinker. The teacher. The dismantler of all teachings. The deceiver. The truth-teller. Plato has been many things to many readers, and the controversies about what he really meant were already underway during his lifetime. In this episode, the first off a series exploring both Plato’s own writings and the equally-important story of how esoteric authors have interpreted them, we introduce a few important points about the west’s greatest thinker: his sketchy biography, his dazzling literary oeuvre, his relationship with his philosophical predecessors, but, above all, his penchant for trickery. The only thing one can say with absolute certainty about Plato is that he wants to turn your certainty against itself. Plato was a man of masks, but, while always hiding behind the characters in his dialogues, he somehow achieved a greater influence as a thinker than arguably any other single person in the history of the west. His contributions to the western esoteric traditions are so fundamental that it is no exaggeration to say that, without Plato, western esotericism would never have existed. Welcome to the world of Plato, where nothing is as it seems. And you can’t even count on things not to be as they seem; they might be exactly as they seem, just to mess with your head and make a point about too-easy assumptions. 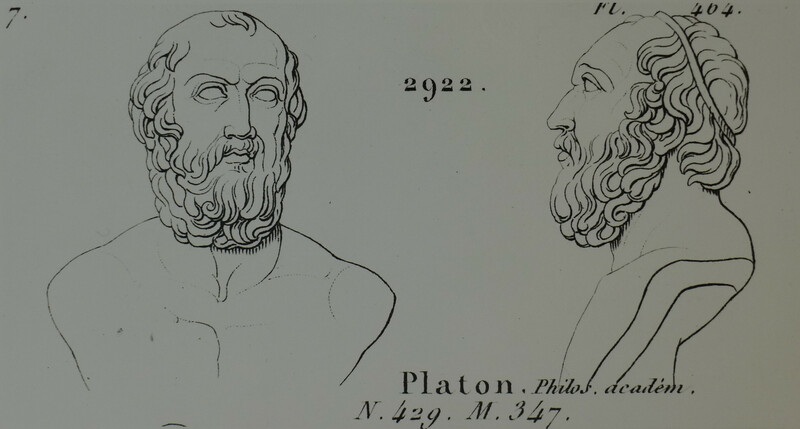 When people cite Plato’s works, they use a set of arcane numbers, letters, and more numbers. These are ‘Stephanus pages’. The 1578 three-volume bilingual edition of Plato’s complete works, published by one Henricus Stephanus (hence the name) at Geneva has page numbers, obviously, and the pages are divided up into five sections of text, a-e. We add to this the line-numbering put in in Burnett’s Oxford Classical Texts edition, and thus have an international standard for citing Plato down to the line. Thus, Pl. R. VII 514a 1-4 refers to ‘Plato’s Republic, Book 7, Stephanus page 514, section a, lines 1-4′. You can browse a couple pages of the original bilingual Stephanus edition here, just to get a feel for the printed page. Whitehead, A. N., 1979. Process and Reality. Free Press, Glenview, IL. p. 39. The Bodleian Library in Oxford has our oldest extensive manuscript of Plato, MS Clarke 39, and you can actually browse through it electronically on their website, which is pretty nifty. Dixsaut, M. (Ed. ), 1993. Contre Platon, vol. 1: Le Platonisme dévoilé. Vrin, Paris. Geffcken, J. (1929). ‘Antiplatonika’, Hermes 64 : 87-109. Hankins, J., 2003. Humanism and Platonism in the Italian Renaissance. Edizioni di Storia e Litteratura, Rome, Vol. II, pp. 27-415, ‘Antiplatonism in the Renaissance and the Middle Ages’.